I originally wanted to call this post "Tank-xiety" or "Everybody Starts Somewhere" but it's late and I want to get this thing out. Also, I probably should keep it kind of short, else I rant on endlessly. I have been known to do that from time to time. Hopefully I can get my thoughts across. I have played every class to some degree. I have done every role to some degree. I am best at DPS, mildly OK (though out of practice) as a healer, and probably a mediocre tank. I have tanked a whopping 5 instances in the 5 years I have played WoW. And three of them occurred yesterday. Recently, my wife has expressed interest in learning to tank on her warrior. At this news I was shocked, mostly because she abhors the thought of tanking. I think a lot of this has to do with the tanking stigma, but I'll get to that. So I thought I would help her out, run her through some instances on my priest to help her get the hang of it. After a practice run, I felt she was competent enough to continue onward. Truth be told, I wasn't wrong after all. Nobody died. Loot dropped. Bosses died. Most everyone had a good time. I felt invincible. I felt like I had all this power. The reality, however, was that I did not have anything, at least in my mind. You see, in the first run, I did not queue as leader. The leader of that group was a 65 hunter with two 63 friends. They also felt invincible, and did most of the pulling for me. I tried to keep up, and while the changes to threat and such made it mostly easy, I felt helpless to grab stray mobs. I'm sure this will ease up as I get more experience (and an actual taunt), but I couldn't help but feel like I failed to do my job PROPERLY. Two more times we queued, once again Ramparts, then Blood Furnace, and were matched up with people closer to our level. I did much better these times, but I still felt like I left something out there. Again, nobody died, bosses dropped, loot was had, etc. But that doesn't mean it was fun. I mean, yes it WAS fun being nigh invincible, but I had help. And I felt like more of a hindrance than I did a help. I felt like, although nobody complained, like I let the group down by not having the best tanking skills, ui setup, or addons to do the job proficiently. It's at this point that my anxiety normally would kick in, and it sure did. My wife was quick to correct me, saying that I did fine, reassuring me that I did just fine. Like I said, NOBODY DIED. And still, despite her consoling, I felt like I could have done better. I felt like if I could have been more bold, taken charge, and communicated better, that we could have had perfect pulls every time. Is that naive, absolutely. Possible? Who knows. My point is that I think tanking will inevitably be good for me. It will help with some of the things I'm supposed to be working on, like communicating, being bold, taking charge, and working through my anxiety when it creeps up. Hopefully I will have my fears more assuaged when I get more Twitterland friends. Of course, that would also take more effort on my part. Why am I such a coward? People will like me if I just give them a chance. At least that's what I'm supposed to believe. Plus, I think it's at least a bit more interesting and exhilarating that healing. But that's for another post. It's hard for me to be bold. I don't like being talked down to. I don't like being wrong. I want to be right, good, respected, wanted, even loved. I mean, love is everything. I have a loving spouse and loving cats of course, but no close friends that I talk to regularly. Yet I tweet with so many great people, I bet if I talked with them on mumble we could become friends. Some day, I promise. So keep me honest, readers. I am thankful to have readers at all, and someday I hope we can all be friends. So if you see a Belf DK named Exatrus, wave hello and don't be shy. I will do all I can to keep you alive. Exlucis is getting closer to being LFR ready. i366 and growing, though truth be told I am cheating with a PvP piece. 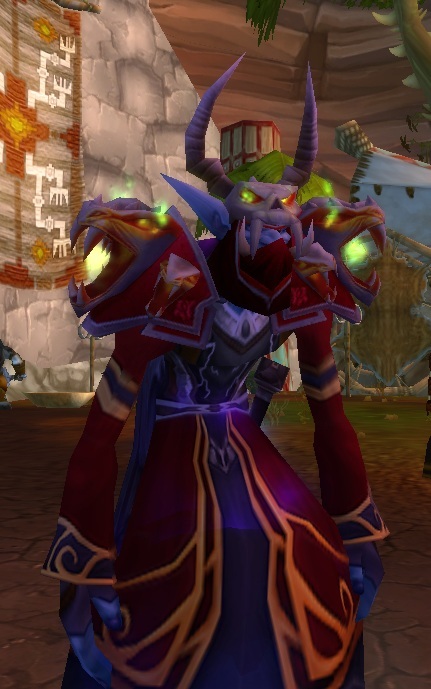 It replaced my original blue shoulders though, so I don't feel like too much of a noob. I took some screenshots of him so the world could get a look at my current mog of choice. Anyways, that's my rant. Again, thanks for the continued reading of my blog. If you are on twitter, feel free to send me a tell or something, I'm always looking for new contacts. Maybe someday I can tank for ya. Setting myself up for... fun?